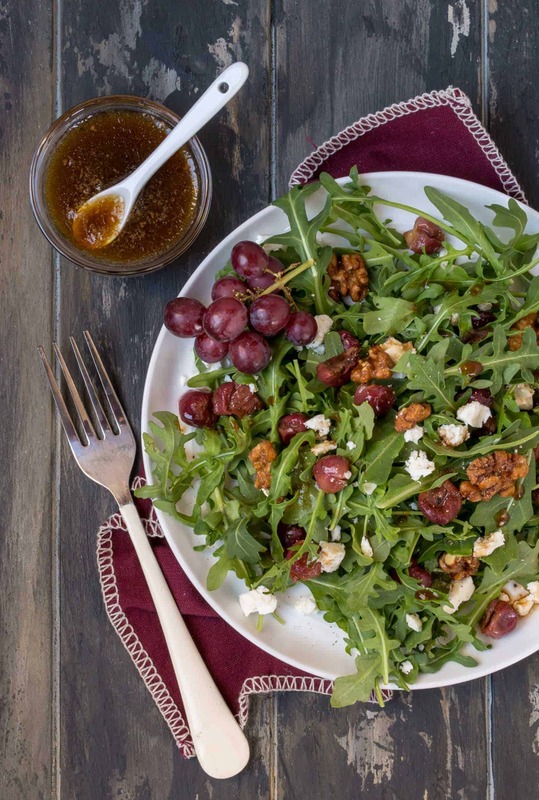 Kick boring salads to the curb with this Arugula Salad with Roasted Grapes and Feta Cheese. I hosted book club at my house a few weeks ago and when I was planning the menu, I knew that an Arugula Salad with Roasted Grapes and Feta Cheese would be a hit. When the five of us go out to dinner, we tend to get a side of vegetables as one of our appetizers, and there are always several salads on the table. Are we weird or just healthy eaters? I wanted to do something a little different for book club, and salads are the perfect blank slate. It is kind of funny how our book club menus have changed over the years as my eating habits have evolved. Don’t get me wrong, I love cheese and butter as much as the next person, but I have been trying to be much more intentional in the amount of vegetables I eat. And now I crave them. Have you ever roasted grapes? Roasting grapes brings out their sweetness even more. Toss them with a little olive oil and balsamic vinegar and give them a quick roast in the oven. The end result? 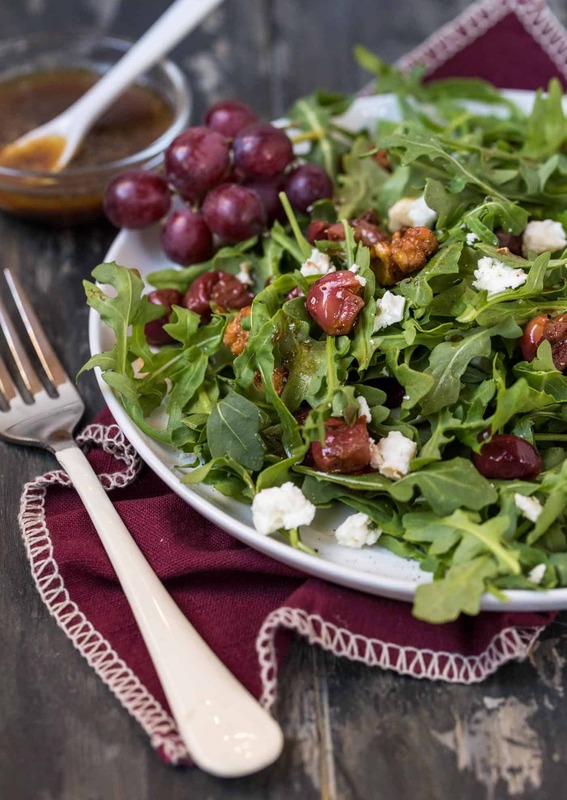 Delicious sweet, slightly acidic roasted grapes that balance perfectly with the peppery arugula and salty feta. Add a quick squeeze of lemon juice and olive oil, and this simple salad is full of complex flavors that are a welcome addition to any meal. As for book club’s opinion? Well, the bowl was empty, does that tell you? Toss grapes with olive oil and balsamic vinegar. Place on jelly roll pan and roast for 10 minutes. Remove from oven and place in a small bowl being sure to get the juices, too. Add walnuts, lemon juice, salt, and pepper. Toss gently to coat. 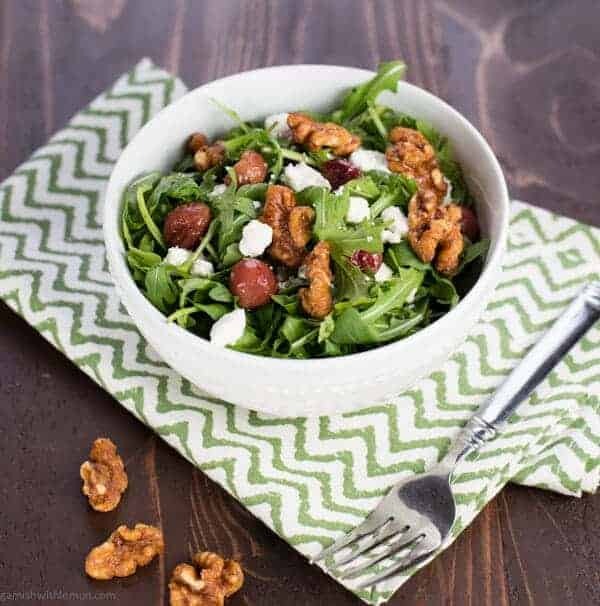 Place arugula in a salad bowl and add the the roasted grape and walnut combination and toss to combine. Sprinkle with feta cheese and serve. Oooh, I like the way you think! goat cheese + roasted grapes = heaven! You always make the most gorgeous salads. I can’t wait to try this one. Salads are always a hit at our get togethers. Oh yum – I love roasted grapes! And all of the flavors in this salad are perfect together! I’ve never tried roasted grapes. Does it matter if they are red or green grapes? The red certainly make a beautiful color presentation! Hi Kathy, You can roast either kind, but the red ones are going to be a little sweeter! I love ingredients that can be used more than one way! Roasted grapes are delicious so many ways! I love roasted grapes, I imagine they are wonderful with the spicy flavor of arugula! They are spot on with the arugula! Great balance of flavors! This is exactly my kind of salad and roasted grapes are wonderful! I’ve used them in crostini but never like this. Must change this soon. No surprise there was none left after your book club meeting ! I confess I’ve never roasted grapes. But that’s about to change. 🙂 Your salad looks marvelous! You won’t regret it, Susan. Roasted grapes are the best! Arugula is one of my MOST favorite greens. I love the zip of the flavor. I make similar salads, but never never never thought of roasting the grapes. Great. The roasted grapes are amazing! They add such great flavor and are so unexpected. I’m with you in your love of arugula! Now that’s interesting – roasted grapes! Love this idea and the combination of flavors with feta and arugula. YUM! Sign me up for this. Thanks for the shout-out for my roasted asparagus recipe too.